Garlic is one of the world's most popular ingredients, adding a pungent flavor to cuisines from around the globe. It consists of several small cloves, surrounded by papery skin and gathered into a bulb. Cooks appreciate its ability to grow in most climates, and its long-term storage ability. However, the cloves are also how garlic reproduces, so it will try to sprout in spring. There are many varieties of garlic grown commercially, but they are generally divided into two main groupings. Hardneck garlic varieties are so called because they produce a very stiff, woody main stem from the middle of each bulb. Softneck varieties produce softer stems, similar to those found onions. Softneck varieties are the ones you see braided and hanging in kitchenware stores. Hardneck varieties will store for longer than softneck varieties, as a rule. Garlic stores best at a cool room temperature of 55 to 65 degrees Fahrenheit, and moderate humidity between 40 and 60 percent. It's best in a breathable container, such as terra cotta "garlic keeper," rather than airtight plastic. If garlic is refrigerated, it will deteriorate quickly and attempt to sprout when you bring it back to room temperature. That's because the temperature change feels like springtime to the garlic. Unfortunately, commercial garlic from the supermarket has almost always been refrigerated, and will not usually last long once you've gotten it home. It may not be easy to tell that your garlic has sprouted at first, because the new green shoots are hidden inside the paper husks. Since your supermarket will probably frown on the idea of peeling their garlic to see how good it is, you'll need to use indirect methods. Pick up the cloves of garlic and squeeze them. 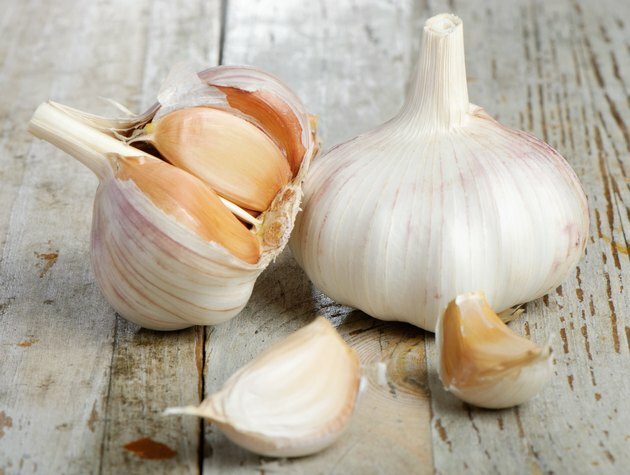 Moister, fresher garlic will feel heavy and full, and the cloves inside will feel firm and plump to the touch. Older garlic will be lighter, dryer and leathery when squeezed. The dryer the garlic, the more likely it is to sprout. At some times of the year, you may not be able to find fresh garlic in decent condition at your supermarket. However, you can still use the sprouted garlic. Peel the cloves as you normally would, and slice each one lengthwise down the middle. The green shoot will be plainly visible. Pinch it at the top and pull the shoot out, because they're bitter and unpleasant to the taste. Mince the garlic and use it as you normally would. Garlic is at its most pungent when it's dry and sprouting, so use less than usual.